George John Cavafy, London, c. 1863; by descent 1891 to his son, John Cavafy, London; purchased 1892 by (Edward G. Kennedy, Wunderlich & Co., New York). purchased 1893 by Isaac Cook, Jr., Maine. acquired by (John Levy, New York), by 1918; James Parmelee [d. 1931], Cleveland and Washington; his widow, Alice Maury Parmelee, Washington; bequest 1941 to the Corcoran Gallery of Art, Washington; acquired 2014 by the National Gallery of Art. The Home Exhibition: A Collection of Paintings Owned in St. Louis and Lent to the Museum, City Art Museum, St. Louis, 1911, no. 84. Sea and Shore, Norton Gallery of Art, West Palm Beach, 1952, no catalogue. Expatriates: Whistler, Cassatt, Sargent, Munson-Williams-Proctor Institute, Utica, 1952, no. 9. American National Exhibition, Sokol'niki Park, Moscow, 1959, not in catalogue. Loan Exhibition. Masterpieces of the Corcoran Gallery of Art: A Benefit Exhibition in Honor of the Gallery's Centenary, Wildenstein, New York, 1959, unnumbered catalogue, repro..
James McNeill Whistler: Paintings, Pastels, Watercolors, Drawings, Etchings, Lithographs, Art Institute of Chicago; Munson-Williams-Proctor Institute, Utica, 1968, no. 9. London and the Thames: Paintings of Three Centuries, Department of the Environment at Somerset House, London, 1977, no. 65. The American Landscape Tradition, Corcoran Gallery of Art, Washington, 1978, unpublished checklist. The Image of London: Views by Travellers and Emigrés, 1550-1920, Barbican Art Gallery, London, 1987, no. 159. James McNeill Whistler, Tate Gallery, London; Musée d'Orsay, Paris; National Gallery of Art, Washington, 1994-1995, no. 36. James McNeill Whistler, Tate Gallery, London; Musée d'Orsay, Paris; National Gallery of Art, Wshington, 1994-1995, no. 36. James McNeill Whistler, Walter Richard Sickert, Salas de Exposiciones de la Fundacion "la Caixa"; Museo de Bellas Artes, Bilbao, 1998, no. 1. Encouraging American Genius: Master Paintings from the Corcoran Gallery of Art, Corcoran Gallery of Art, Washington; Museum of Fine Arts, Houston; Parrish Art Museum, Southampton; Mint Museum of Art, Charlotte; John and Mable Ringling Museum of Art, Sarasota, 2005-2007, checklist no. 33 (not shown in Washington). 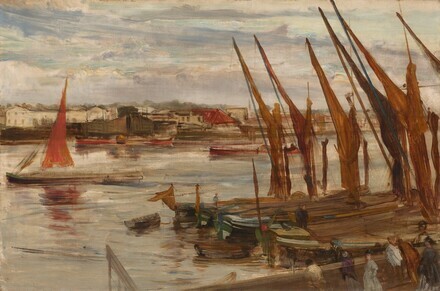 Monet's London: Artists' Reflections on the Thames 1859-1914, St. Petersburg Museum of Fine Arts, Florida; Brooklyn Museum of Art; Baltimoe Museum of Art, 2004-2005, no. 46. An American in London: Whistler and the Thames, Dulwich Picture Gallery, London; Addison Gallery of American Art, Andover; Freer Gallery of Art, Washington, 2013-2014, no. 28. Corcoran Gallery of Art. Handbook of the American Paintings in the Collection of the Corcoran Gallery of Art. Washington, 1947: 45. Corcoran Gallery of Art. Masterpieces of the Corcoran Gallery of Art. Washington, 1959: 53, repro. Dorment, Richard, and Margaret F. MacDonald. James McNeill Whistler. Exh. cat. Tate Gallery, London; Musée d'Orsay, Paris; National Gallery of Art, Washington, D.C. London, 1994: no. 36, repro. Simpson, Marc. "James McNeil Whistler, Battersea Reach." In Corcoran Gallery of Art: American Paintings to 1945. Edited by Sarah Cash. Washington, 2011: 36, 128-129, 202, 265-266, repro.